Quit your job and embrace your calling. I don't mean you have to stop your current employment. Rather, quit looking at your work as a job. Here's why. Humans have a distinct need that separates us from other life forms. It is the need for meaning. There are two primary ways we can fill this need . . . work and love. It is easy to make a logical error by thinking our primary choices about work and life come down to either 'living to work' as in becoming a workaholic or 'working to live' as in becoming a European. I must admit for most of my adult life I have been such a champion of work-life harmony that I strongly favored the relaxed approach to work I found in Italy as a young student. Yet, ultimately I found that making life-enjoyment one's primary aim is too empty. After spending the better part of eight years surveying and interviewing nearly 30,000 people about what made life worthwhile I came to some simple truths. There are 7 billion people on earth and no two people are exactly the same. Each of us is different for a reason. That reason is to make our difference. When we change our world for the better, the world changes for the better. Our choices of what we do for work and how we do it, matter. These three ideas deeply influenced me in my career and in the career training I do for corporations and universities. Consistently doing satisfying, meaningful work comes down to one big choice. Do you want a calling? A job is simply a way to make money so you can live the rest of your life. The primary demand of a job is to be responsible. Show up, and do your work faithfully. At times, we all must do jobs. The financial stresses and practical demands of life simply require it. There are bad consequences to not having enough money to take care of your own needs and fulfill your genuine responsibilities. However, if you work in a job too long it is likely to become a prison. You may think you have no choice. But it's a trap to think that you ever reach an age where you cannot learn what you need to learn to escape the grind of the job and find the joy of your calling . . . a calling that will make you all the money you need to live a life you love. 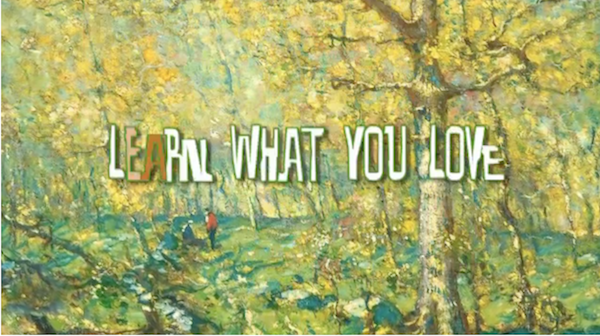 I challenge you to LEARN WHAT YOU LOVE. I've included a four minute video below of how to do just that. Many successful people choose a career over a job. The primary demand of a career is mastery. People who are exceptionally competent in a high demand field can make a lot of money and acquire the trappings of modern-day success. However, this is no guarantee that you will be doing meaningful work. That is, work that is meaningful to you. It is widely known that professionals who have the deepest regret about their career choice are lawyers. By age 40, surveys show that 52% of lawyers wish they had made another career choice. Lawyers are not alone in the simmering stew of regret. Careers that demand expensive education can also be traps. It is easy to make a logical error thinking that you have invested so much time and money in a career that you would be crazy to change. That's not true. Some of the most successful and happy people I interviewed in my research are people that made massive and surprising career changes. I met a lawyer who became a high school teacher, and a fashion executive who became a spiritual life coach. I met many others with similar stories. What they have in common was that they are great at their work and are happy to do it. What they found is nothing that they had learned was wasted. They are satisfied because they had found their calling. Finding your calling requires two primary things: Courage to face your truth and deeper than average self-awareness. The primary demand for a calling is to do work that reflects your purpose, personality, and values. You'll notice that it does not require you to do work that is directly aimed at saving the world. Once you become intentional about transforming your work into your calling you will see your work in a new light and pursue your work in a new way. As I said, the world needs all of us in our many varieties and interests. Surveys of all job categories find that about 30% of working people find their job both purposeful and a way to express their values through their personality. In this way work gives them energy rather than drains it. So how about you? What are you doing for work right now? Is it a job? A career? Or a calling? Let me encourage you. Don't settle for a job. Don't degrade your life for a career. What you do matters. You are designed perfectly to succeed at your true calling. And please believe me, with all the research I've conducted and all the coaching that I've done, I can assure you what I am saying is not goofy, pie-in-the-sky. Many people have it all, and so can you.